This is an elegant, classic dessert for a Winter holiday meal. 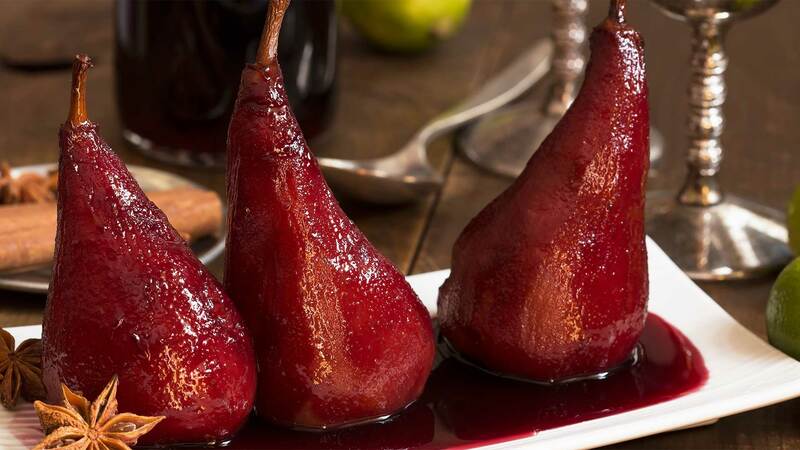 Traditionally, firm Bosc pears are used because they hold their shape through the poaching process. Put the wine in a deep saucepan just large enough to hold pears. Zest the orange and add zest and orange juice to wine along with sugar, lemon juice, cinnamon, cloves, star anise and ginger. Stir to mix and dissolve the sugar. Prepare the pears. Slice off the bottoms of the pears (if necessary) so they will stand straight on the plate. Core the pears from the bottom using apple corer. Carefully peel the pears – leaving the stems intact – and add each one as peeled to poaching liquid to prevent discoloration. Poach the pears. Once all pears are in the liquid, bring to just below simmer stirring gently to help melt the sugar. You want the liquid to cover all of the pears so that they cook evenly and thoroughly. To keep the pears submerged, cover them with a circle of parchment paper ½˝ larger than the pan (also cut a hole in the center of the parchment paper circle), and weight the paper with a small plate. Do not let the liquid boil. Poach for approximately 20 minutes – the time will vary with size and ripeness of pears. When the pears are done, it should be possible to pierce the bottom easily with a sharp knife. Once done, let pears cool 10 minutes in liquid. When the pears are done, it should be possible to pierce the bottom easily with a sharp knife. Once done, let pears cool 10 minutes in liquid. When the pears are done, it should be possible to pierce the bottom easily with a sharp knife. Once done, let pears cool 10 minutes in liquid. When the pears are done, it should be possible to pierce the bottom easily with a sharp knife. Once done, let pears cool 10 minutes in liquid. Remove the pears to a glass or ceramic bowl. Strain the poaching liquid and cover pears with the liquid. Refrigerate covered with plastic wrap at least overnight, and up to 3 days. Before serving, return the poaching liquid to the pan and boil to reduce until it is syrupy – approximately 30 minutes. After reduction, you should have about 1 cup of syrup. Pears are best served at room temperature, so the pears have to be removed from the refrigerator approximately 2 hours before eating. To serve, pour the syrup over each pear, and garnish as desired. You can also serve with mascarpone, crème fraîche, whipped cream or ice cream. Why not grow your own pears? Click here to see our selection of pear trees. Here is our Bosc pear tree.